The Night of the Hunter has been referenced by the Coens before (most notably in Raising Arizona, where the knuckles of Randall "Tex" Cobb's apocalyptic biker are tattoed with the words "Love" and "Hate")[see Bill R.'s comment below.-ed.]. 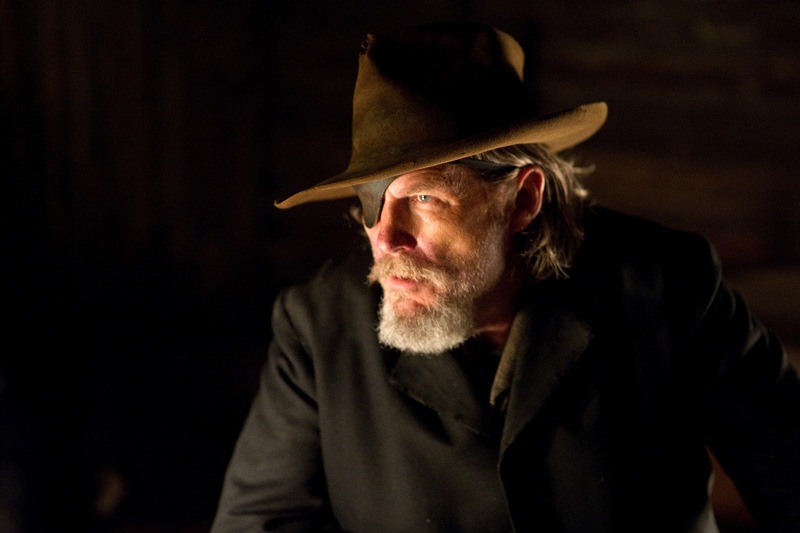 But in 2010's True Grit, besides the prominent piece of music Jameson refers to, we have a more pronounced stylistic choice which recalls Charles Laughton's famous film. One significant departure the new version takes from the old Hathaway film is its strict reliance on telling the story from the point of view of an elderly Mattie Ross as filtered through the compromised hindsight of memory. 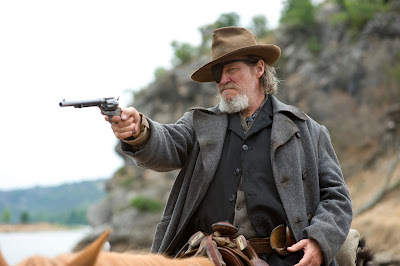 True Grit's prologue, an impressionistic (as Bill R. alludes to in his wonderful post, A Love of Decency Does Not Abide in You) scene in a beautiful snowscape, depicts the murder of Mattie's father by a shadowy figure she identifies as Tom Chaney (Josh Brolin). From there the Coens' movie treads along the same faithful path to Portis' book as the Hathaway picture did, for the most part (from what I hear, I admit I've never read it myself). Mattie hires a cantankerously lethal U.S. Marshal, the one-eyed Rooster Cogburn (Jeff Bridges), to hunt Chaney down. LaBoeuf (Matt Damon), a Texas Ranger with his own reasons to capture Chaney—alive—tags along. Ross insists on travelling with the two men to ensure Chaney is executed by Cogburn instead of arrested by LaBoeuf. As I said, all familiar to those who've seen the original Hathaway version (except for some interesting Coenesque digressions which I'll come back to)... that is, until its transcendent(al) climax. At this point True Grit fully embraces the influence of The Night of the Hunter. When Mattie falls victim to a snakebite, Rooster picks her up onto her small horse, Little Blackie, and rides under a strikingly dreamy starry sky. Roger Deakins' surreal cinematography resembles the Expressionist stylings of Hunter's Stanley Cortez. Midway through that film as the children take flight from Robert Mitchum's evil preacher, it is as if they fall through Alice's rabbit hole into a nightmarish wonderland where the sky is blanketed with a multitude of stars, and giant animals surround them. Here, Mattie's memory, hobbled by the feverish effects of the venom, highlights the most distinct features of her experience, the giant faces of her black horse and the larger than life Cogburn against the starry black sky. This sequence ensconces the film in the pantheon of other movies which rely on the recollection of children, such as the aforementioned Hunter and Robert Mulligan's To Kill a Mockingbird. The Coens cast an actual thirteen-year-old, Hailee Steinfeld, as Mattie Ross and never let up from presenting True Grit from her point of view, a notable difference from Hathaway's original adaptation in which the dual perspective of Ross and Cogburn is quite a bit more objective. In the Coens' film, "What she doesn't know, we don't know," and what we do know is filtered through the perfectly delineated mind of a young teen, something far more difficult to get across in Hathaway's film where Mattie was played by the talented, but twenty-one-year-old, Kim Darby. When Steinfeld's Mattie first meets the handsome LaBoeuf, there is the mystique about him that might impress a young girl beginning to deal with the confusing feelings of emergent sexuality; he sits on a porch rocking back as he menacingly smokes a pipe, his spurs glistening in the light of dusk. The protective (and much older) Cogburn, dangerous as he is, provides a less threatening alternative, filling the vacancy left by her father. Perhaps it is her benign recollection of him which burnishes his questionable reputation. Or perhaps it is the solidarity forged by the strange digressions I mentioned earlier, interludes which she alone shares with Cogburn while LaBoeuf is elsewhere: an eerie encounter with a hanging corpse; a run-in with a mysterious trapper. (Although there is no embellishment, at least not a positive one, of Cogburn's feelings towards two Indian kids). And the film elides over the injured LaBoeuf's final fate after he helps raise the snakebit Mattie into Cogburn's arms so the marshal can rush her to safety. He lives in the Portis book and dies in the Hathaway film. Here, he is simply forgotten. 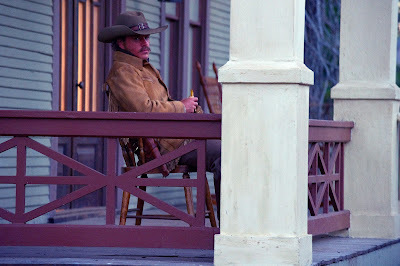 As Jameson states in his review, "The beauty of it is, though, that we don't have to pick one..." Interestingly, then, the Coens' True Grit can be viewed as complementary to the Hathaway version. Taken together, both films give us a well-rounded interpretation of the Portis book. 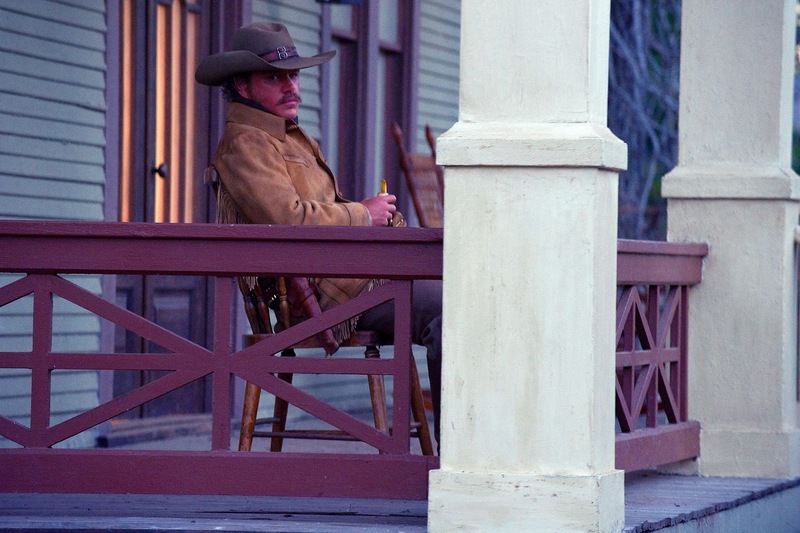 Hathaway's is more complete, lengthier, surprisingly more nuanced when it comes to the motivations of Cogburn, LaBoeuf, and Chaney, because its perspective is from more of a remove than that of the Coens' film. The Coens' True Grit supplements Hathaway's by turning a simple story of revenge into a child's aggrandizement of a mercenary from flawed drunkard to heroic father figure (and maybe more the Coens' epilogue suggests). A remake which doesn't look to supplant the original film, but instead enhances it, proves there's room enough for two True Grits. I agree with Richard Jameson's and your thoughts on this work, which I've just seen. This is a worthwhile film on its own. The horseback ride under the starry sky is marvelously filmed and truly breathtaking. I just wish there were more memorable visuals in the film, a quality I've come to expect from the Coens (this despite the typical brilliant cinematography of Roger Deakins). This is a well-told tale and much more straightforward than the typical Coen opus. For me, this needed a little more quirkiness. It's a watchable film, but not as engrossing as some of the finest work turned in by the brothers, such as No Country for Old Men or The Man Who Wasn't There. One of the more blatant Hunter Reference is the way the score is built around the motif of "The Everlasting Arms" (and the film ends with a full on rendition of it) which was Gish's favored hymn in Hunter. Great review, Tony. It's funny you mention the night ride at the end evoking NIGHT OF THE HUNTER, as does the use of "Leaning on the Everlasting Arms", because when I first heard that music I thought "Oh, it's that great hymn from NIGHT OF THE HUNTER", but watching the night ride that film never occurred to me. But you are, of course, correct. And I called the filmmaking there "impressionistic" in my review, but I probably did mean "Expressionistic"...I get those two mixed up. One thing, though: I don't believe Randall Cobb has "love" and "hate" tattooed on his knuckles in RAISING ARIZONA. I've seen that movie a million times, and I don't remember that at all. However, at one point Nicolas Cage says "It's a hard world for the little things", which is a line from NIGHT OF THE HUNTER. Bill, did I really get that wrong? I'll defer to you since I know you're the Coen expert. I was iffy on it in the first place since I haven't seen RAISING ARIZONA in years (it's the only Coen film I don't own, despite it being one of my favorites because I've been holding out for a proper anamorphic release). But I checked on the internet (lotta good that does me) and another person had confirmed it in some forum. Is ther some TV alternate cut floating around out there? I actually meant to cite you for the impressionistic quote (which you were correct in using), but overlooked that in my haste to publish this. "Expressionistic" is something I specifically reserved for Cortez's cinematography in the latter half of HUNTER which recalls the pre-1930s German film movement. In any event, I corrected both the article and the forgotten citation in my post above. Thanks. PS: A no-prize for any readers who can sort out my mistaken "love"/"hate" tattoo issue for me. No DO THE RIGHT THING explanations, please. I know about that one. Maybe it's in another Coen film? I haven’t read the book, so I’m going purely on the words and reviews of others, but I’ve read that the dialogue and cadence in the movie is true to Charles Portis’ original written work, and not something the Coen brothers just invented. A remake which doesn't look to supplant the original film, but instead enhances it, proves there's room enough for two True Grits. This is an excellent piece with a great conclusion. I love the original, but I also love the Coens' film. In fact, after feeling that it lacked emotion on first viewing, on second viewing, I felt its more subtle emotional tone coming through, and I'd see it again. Thanks for stopping by, Hokahey. I would apply your comment to most of the Coens' films. They gain immeasurably from a second viewing.